Black Diamond is GemSeal’s new, high performance alternative to asphalt emulsion (AE) sealer and refined tar sealer. With all the environmental benefits of AE sealer, Black Diamond exceeds AE performance with longer durability, increased toughness against power steering marks, and stays impressive non-fading black color. Black Diamond also provides performance similar to refined tar sealer’s fuel resistance, durability, and ease of application. Finally, like all GemSeal pavement sealers, Black Diamond is manufactured with our precision colloid mill system, providing a product that will always be consistent and backed by our nationally recognized quality assurance program. *Burn free – crews will love to work with it! MANUFACTURING PROCESS – Colloid Mill vs. Batch Manufacturing: Is there really a difference? 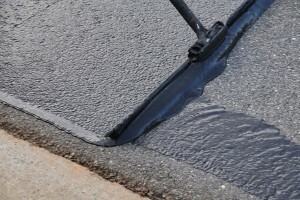 GemSeal uses proprietary colloid mills to manufacture all of its pavement sealers. Some may ask how sealers produced by a colloid mill differ from sealers made with a ribbon blender or other batch process. Simply put, colloid milling is a continuous process which applies consistent, high shear forces to create the most uniform microscopic particles from the raw materials to produce a highly stable and homogenous emulsion. Batch processes cannot achieve this, no matter how skilled the operator. In a batch system, conditions under which emulsion particles are generated vary significantly during the process. At the beginning of a batch, temperatures can vary, liquid volume of the batch is relatively small, and there is no ability to create adequate pressure by which to enable better shear. At the end of the batch process, the rising liquid level above the mixing blades reduces the ability of the raw materials to blend, compromising material consistency. For a more visual explanation of the difference, picture sealer made with a process similar to a turbine engine versus a cake mixer. The colloid mill resembles a jet engine in its design, performance, and complexity. The end product reflects a more sophisticated technology in the manufacturing system: raw materials are squeezed using pressure and sheared through tight tolerances of the mill’s rotor and stator. Controlled pressures, temperatures, and flows deliver a homogenous pavement sealer with consistently sized particles. This creates a more stable emulsion for better performance in longevity and color consistency in the field. A batch system is similar to a cake mixer, where conditions are constantly changing throughout the process. This simplicity means that some particles may not get properly mixed or sheared. Sealers made with a batch process are potentially unstable and can be less predictable. The results are real. What does this mean to you, the contractor, or property owner? GemSeal pavement sealers made at our plants equipped with proprietary colloid mills outperform batch-made sealers. In more than 50 years of manufacturing sealers, colloid milled sealers have shown better color uniformity, consistency, and performance from load to load. Never guess what you get when pavement sealer arrives on your jobsite. With GemSeal’s precision-controlled colloid milled sealers, you can expect the best. YES, there really is a difference. When deciding which sealer to use on a job, understand the differences in manufacturing before you buy. Then be sure to ask for GemSeal products, certified tested and made with precision colloid mills for superior parking lot performance.